Despite being tricky at times, home-buying can, in fact, be a smooth and easy process. 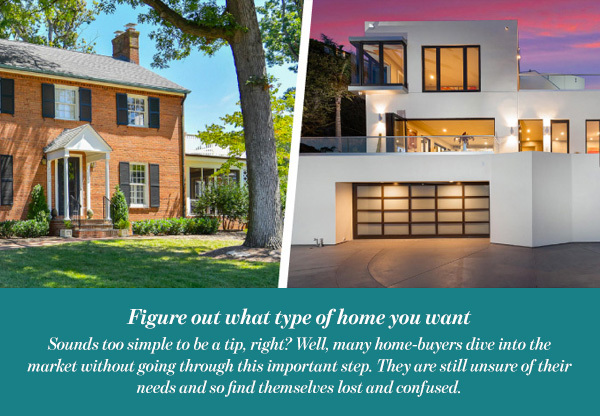 However, in order to guarantee a mostly simple home-buying journey, there are a few steps you should take before you begin. These steps will not only help you purchase the best home for you, but also allow you to make a safe decision. Anyone who has bought a home knows it can be scary. Sometimes, you discover the home is not all you wished for, only you find out too late. This is why it is important to follow these easy and simple home-buying tips. Sounds too simple to be a tip, right? Well, many home-buyers dive into the market without going through this important step. They are still unsure of their needs and so find themselves lost and confused. Before even considering calling an agent, figure out what you want in your new home. Are you looking for a unit in an apartment complex, or is your dream a stand-alone villa in a multi-use development. Knowing the type of home and lifestyle you are seeking will help you limit your options and start off on the right track. It’s not enough to know the type of home you want, you should also have an idea of the surrounding area you wish to live in. 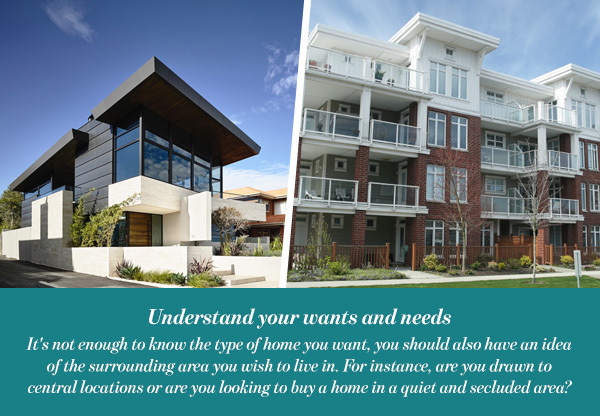 For instance, are you drawn to central locations or are you looking to buy a home in a quiet and secluded area? Moreover, are you looking for a specific internal design or are you open to anything? Whatever the case, it helps to know your desires. This way, you can communicate exactly what you want to the agent. Their job will be to find homes that are closest to what you have in mind. 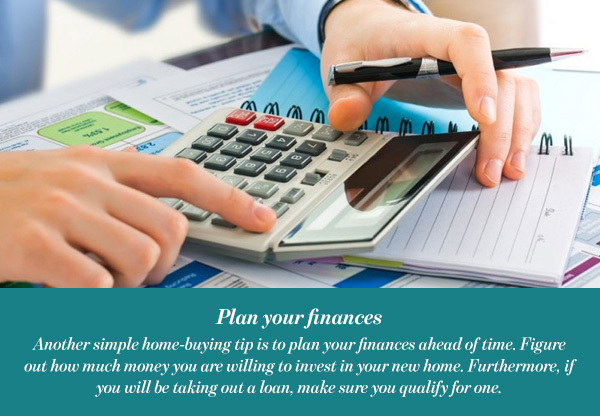 Another simple home-buying tip is to plan your finances ahead of time. Figure out how much money you are willing to invest in your new home. Furthermore, if you will be taking out a loan, make sure you qualify for one. Try to ensure that you will be able to keep up with the mortgage without suffering too much. Limiting yourself to a budget will ease the process for you as you will be looking for homes within your price range. Of course, the budget can be a little flexible, as long as it doesn’t affect you too much. The next step in our home-buying journey is to find a real estate agent. Do some research and ask around, you can even meet with a few agents before hiring one. It is very important to find an agent who is credible, someone you can easily talk to and communicate with. Once you have found your agent, you will discuss what you are looking for. Let them know the specific home features you want as well as your budget. This will allow the agent to find homes that meet your needs. 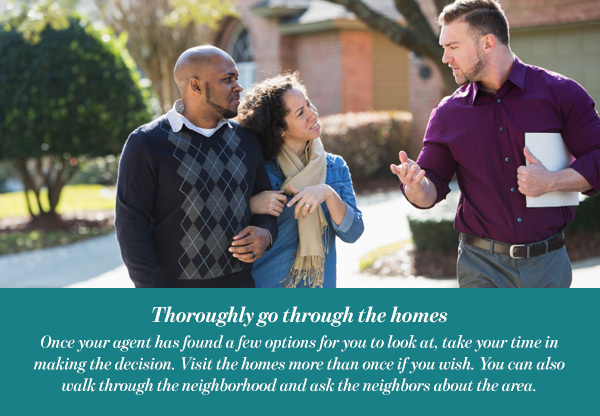 Once your agent has found a few options for you to look at, take your time in making the decision. Visit the homes more than once if you wish. You can also walk through the neighborhood and ask the neighbors about the area. Compare the homes, eliminate the ones that don’t provide you with all your needs or exceed your budget. Imagine how your life would be in each home and think of any changes you may want to make. Finally, consider which house feels like home to you. Remember, buying a house is both a logical and emotional decision. If you happen to find your dream home, congratulations! Now you are only a few steps away from starting a new life. 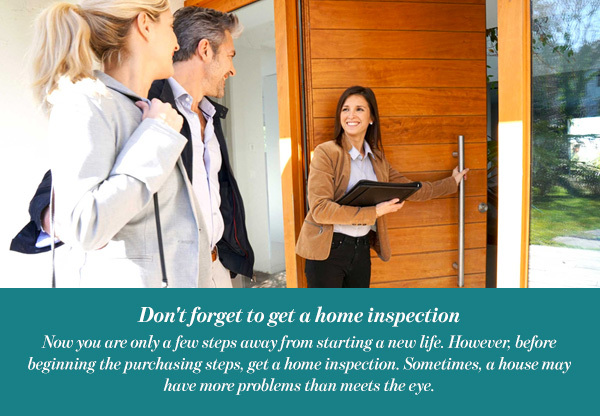 However, before beginning the purchasing steps, get a home inspection. Sometimes, a house may have more problems than meets the eye. Hire a professional to inspect for quality, safety, and the overall condition of the property. If the house is relatively fine, then go ahead and make an offer. If, however, it has more problems than the seller disclosed, you can either negotiate a discount or ask the seller to make the repairs. Keep in mind that the repairs may be too much for you to handle and will make you go way over budget. In that case, walk away from the home and keep looking for a better option.